Dr. Aghassi received his medical degree from Tehran University of Medical Sciences. 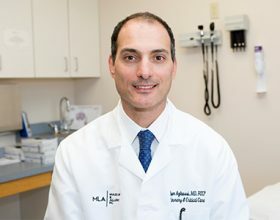 He completed his residency in Internal Medicine and Fellowship in Pulmonary and Critical Care Medicine at UMass Medical Center/UMass Medical School. Dr. Aghassi is also an Assistant Professor of Medicine at UMass Medical School. He is Board certified in Internal Medicine, Pulmonary Disease, Critical Care Medicine and Sleep Medicine. He is also a Fellow of American College of Chest Physicians. Dr. Aghassi is the President of Mass Lung & Allergy, PC. His areas of interest include Interventional Pulmonary, Critical Care, Sleep disorders, Asthma and COPD.